The White-lored Euphonia (Euphonia chrysopasta) is a South American songbird found in Bolivia, Brazil, Colombia, Ecuador, French Guiana, Guyana, Peru, Suriname and Venezuela. They are between 11 and 12 cm long (including the tail). 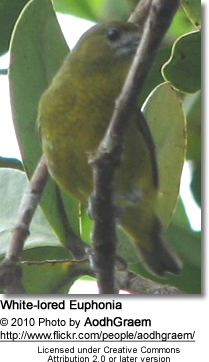 The male has dull plumage, olive above. The back of the head, nape (back of the neck) are grey. Below they are golden yellow mottled with olive. He has a conspicuous white loral area (area between the beak and the eye) and chin. The female looks like the male, except her underparts are pale grey.